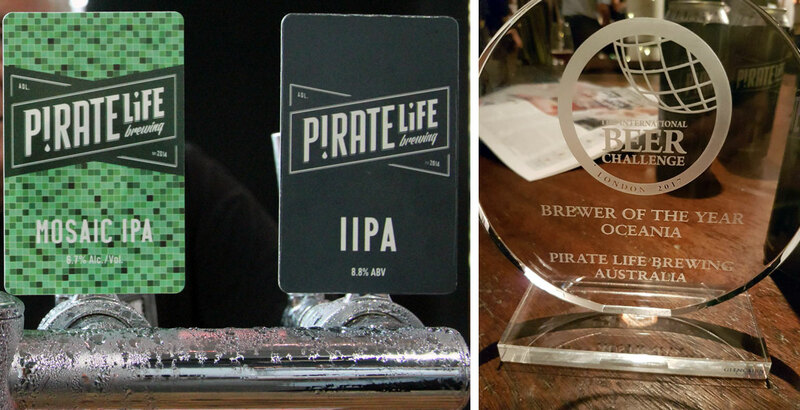 Pirate Life continued its run of trophy success in London overnight, collecting the Brewer of the Year – Oceania title at the International Beer Challenge. Leading the way for the Adelaide-based brewery was its IIPA, with the 8.8 percent ABV that achieved a podium finish in this year's GABS Hottest 100 picking up a gold medal. It was one of three golds awarded to Australian breweries at the annual competition that focuses solely on packaged beers and has been a happy hunting ground for local brewers over the years. The other Aussie golds went to two more big beers: Prancing Pony for The Hunt For The Red Velvet, a high octane blend of imperial stout and fruity IPA; and Hawkers for its 2016 vintage Imperial Stout. Pirate Life's trophy comes just days after the biggest ever survey of Aussie craft beer drinkers named the brewery Australia's best and weeks after its Mosaic IPA took out the Champion IPA trophy at the 2017 Craft Beer Awards, which was followed 24 hours later by a trio of awards at SA's annual beer awards. All three Australian gold medalists are exporting beer to the UK. The major trophies on the night went elsewhere, however. Firestone Walker, which launched in Australia at this year's Good Beer Week, took out Supreme Champion Beer for its Union Jack; last year's winner was Prancing Pony's India Red Ale. Best Ale Up To 5 percent ABV went to Welsh brewery Tiny Rebel for Cwtch – a beer also available in Australia. As for Supreme Champion Brewery, that title passed from last year's winner Hawkers to the Boston Beer Company, home of Samuel Adams beer. You can check out the full list of winner here.